Many people and church bodies conclude that Jesus must be speaking figuratively. After all, a literal understanding seems physically impossible if not disgusting. When Jesus’ disciples heard this a majority decided to leave him. They concluded that this was “too hard of a teaching”. Had Jesus just been using just a graphic figure of speech, He could have easily explained himself and retained his disciples. He didn’t. Jesus’ words push the limits of our ability to understand. In fact, Jesus said that without the aid of the Holy Spirit, you can’t understand them. Jesus is speaking about a supernatural bond that must exist between him and anyone who will be with God in eternity. Jesus must be in us. I’m not talking about in our memory, our trust, our religion, our minds or our actions. While all these are valuable, these are more symptoms of a deeper reality than the reality itself. Remember that when we are talking about fulfilling God’s requirements and living with God in eternity, we are talking about things from the culture of God. We are not talking about human culture. In Western culture, we want to make everything intellectual (understanding, choosing, believing). We understand this. Western thinking wants to force Jesus’ words in John 6 into an understandable little box. God does fit into a box. Objections about the physical impossibility of a literal understanding of what Jesus is saying are ridiculous. God is able to do whatever He wants. If He needs to convey the body and blood of Jesus to you in bread and wine, that is not too hard for Him. 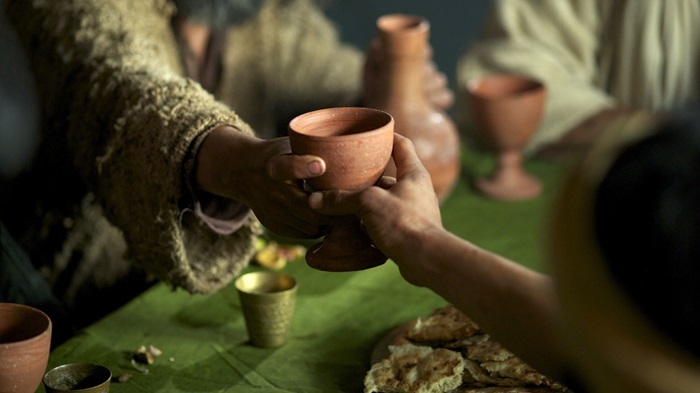 Some have objected that “body and blood” are part of Jesus’ human nature and therefore can’t be everywhere communion is celebrated. Are you sure? Jesus’ body and blood also walked across the surface of a lake. That is impossible too. Jesus’ teaching is counter-intuitive, counter-cultural, and literally out-of-this-world. What else would it be? Previous What Is “Sin” Anyway? Next What Makes a Disciple?